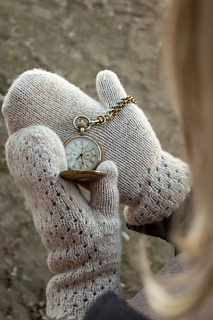 The <big>Karen Double Layer Mittens<small> are worked as one piece in the round but it’s not double knit! First you will work the inside mitten from the top down in one color then you attach the second color yarn and work the outer mitten bottom up. Easy right? With double layers, these mittens will be your warmest mittens ever. The lace work on the back allows for your inside mitten color to peek out. Cute and warm! The inside mitten is worked straight in St st, the outer mitten is worked in lace pattern around the wrist, lace on the back side and St st on the palm side. Thumb sts for the inside mitten and the outer mitten will be picked up and worked separately. We love seeing what Pepperberry Knits patterns you make. 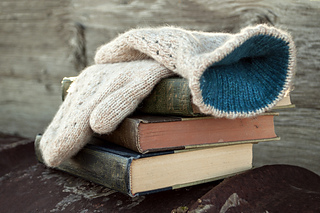 Join our Ravelry Group. You can post pictures, join our KAL’s, get coupon codes and make new friends. Rnd 3: sm, k to marker, sm, k to end. k in rnd for 8 rnds.